John Anderson (the UK one) is particularly remembered for his series of six short films for potters made between 1963 and 1985 and distributed among the pottery fraternity of the UK. The video masters of five of these were given to the Leach Pottery for safekeeping. The sixth, and possibly best-known is devoted to the Yorkshire country potter, Isaac Button, the master tape of which is preserved in the Yorkshire Film Archive and a copy can possibly be purchased from there. Japanese Pottery Equipment (e.g. tools or 100 different tissue transfer designs, and various accessories… can be purchased through www.japanesepotteryequipment.com and using the code ‘subversive’ gets you a discount of 15%. More things Japanese or Japanese in ambiance can be found at www.mingei.com.au a storehouse of indigo-dyed textiles, clothing such as jackets, trousers, shirts etc in this – with shibori incorporated, plus the simple, wood-fired porcelain, superb tableware of Sandy Lockwood. Another ceramic teaching centre that could prove to be more of a holiday…. In Sayan, Ubud, in the middle of Bali. Offers two-week intensives or weekly/casual classes, “taught by internationally renowned clay artists from all over the world”. Finally, a new magazine hitherto undiscovered. 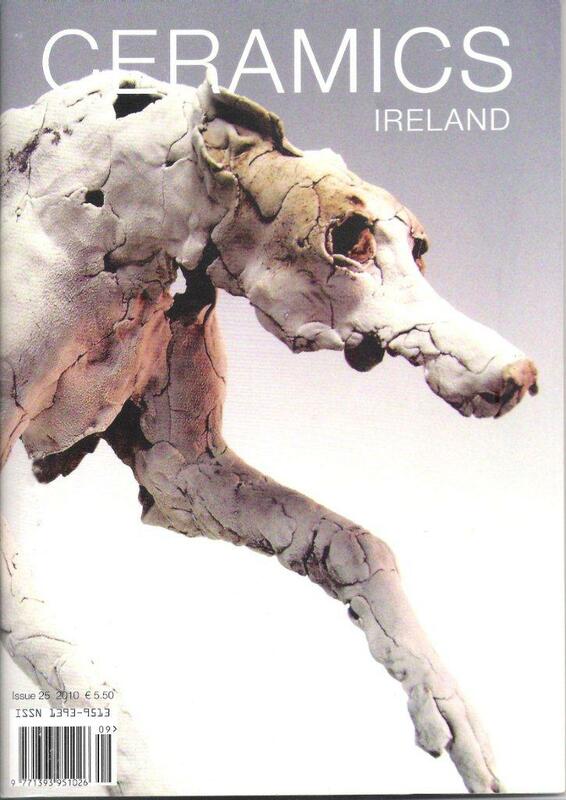 CERAMICS IRELAND is much like the good old New Zealand Potter used to be… A4 format and a mix of articles, mainly about the regional but one or two with international focus about individual and groups of artists, exhibitions, galleries etc. You’ll find exhibition reviews of all sorts and articles on the degree shows at the six tertiary training centres still extant in Ireland. (Aren’t they lucky!) There are also how-to-do-it sections, obits and generally uncritical book reviews, news on competitions and events (They get to hold some in real castles!). Articles range from the critical text through to those that read as if written by the artist’s best friend. It’s a kindly eye upon the wide arena that is current practice in Ireland. The stated purpose of the magazine is to promote and inform about, and to, ceramics in Ireland. And that is exactly what it does. My eye was drawn to the stunning work on the cover made by a fairly recent graduate, David Withers, who has just been offered a scholarship by The Royal College. For those still fascinated with the romance of the wheel, the wonders of U-Tube allow comparisons and education in every possible direction.Start with the legendary Isaac Button – last of the English country potters who could reputedly throw a ton of clay a day, 122 pots an hour and 1200 a day! (I recall in the ’80s being impressed by folk here who claimed a ton a month!) We have to remember that speed was essential because those country pots sold for peanuts being the disposables of the day. Anyway, Button’s economy of style and un-precious approach is matched by an elegance of movement that is a pleasure to watch – all done to strains of the ‘Dying Swan’ and with pipe clenched firmly between his teeth! Then try a modern master – Takeshi Yasuda demonstrating in Denmark. Again an un-precious approach, throwing off the hump and altering after making the walls. And joining two pieces freshly thrown. Intelligent reactions to what is happening before his eyes – and in the thinnest porcelain! Nevertheless one gets the picture that he knows what will happen – experience, trial and error are part of the history here. Youtube.com/watch?v=4u_w-egRbkU&feature=related Then try Bernard Leach himself working on a thrown form (? already made by Marshall) where he completes the form and talks in that inimitable BL style. The throwing is very controlled, expert, but a will to make the clay do what he envisages as end result rather than work with what is happening, a la Yasuda. Decide for yourself what approach you prefer or suits your own way of throwing. Finally here is something featuring some of the ‘big name’ Americans from the 50s although this was made later than that at some Mudfest gathering. It advertised Hamada, Voulkos, Soldner and Reitz and there they all are but the maker has become a tad carried away with ‘arty’ cutting and blending as well as some superfluous music. One ends up noting the art of the film-maker rather than the art of the artists being filmed. So this is really less a chance to compare throwing styles for the aficionado than a work in itself to contemplate. Still, you can smell the testosterone from this far! New Book Release on one of NZ’s pioneer potters of the 1950s – a unique individual and important teacher. I have not yet read it but understand it covers all her interests – education, art, pottery and conservation of natural resources. I have just received an invitation to forward names of anyone potentially interested in a year-long residency at a State University commencing this September 1st to August 31 2012. The town is Wichita Falls, north-west of Dallas and easy short and inexpensive flights from places like New Orleans, Santa Fe and Memphis. Application Deadline is July 31st. So be quick! This is what is called a self-directed residency meaning no tutorials etc as the artist is expected to progress their own work at their own pace but in the creative and energetic environment of a university ceramics programme. Expected also is informal (read unpaid) collaboration and mentoring of students while working in the common space. All materials are provided, plus an office and storage space. Plenty of studio space alongside students. 24 hour/7day access to studio. Full University staff privileges – shipping discounts, library, parking, gym etc. In exchange the resident will be responsible for …. Facilities are very good with ample equipment such as clay mixers and pug-mills and kilns. So, if you can support yourself for a year (or have a partner who will help out) on minimal income and are interested in progressing a teaching career in ceramics in great facilities, or simply pursuing your own work for a year, towards exhibitions etc -go for it! Please be in touch with moyraelliott@gmail.com in first instance and more information can be sent but if interested prepare the following…. as these will be required. A head by the incomparable Gertrud Mohwald. Using shards, plus fragments of paper, fabric and other detritus sourced over years from old bomb sites in East Germany, these are embedded into a rough terra-cotta. Her heads express the uniqueness of what exists – the shards stay dirty, the cloth and paper scraps retain their frays and stains, the metals their rust, bits of plaster and concrete stay half-buried and her fingerprints remain. Life and time has left its mark on her work and she portrays a world that is not intact but one that has been destroyed, piece by piece down from the entirety into which mankind is born. Their wounds are obvious yet they retain an internalised dignity that is inviolable despite all that has happened. The heads by Mohwald are among the most celebrated works in ceramics to come from Europe in the 20thC. People knew little of her or her work until the 1989 reunification of Germany and she emerged to a career in teaching and exhibiting that was cut short by a motor accident in 2002. NEW YORK. While roping in $23m, Christie’s sale of the Chinese art collection of the late Morton and Grace Gordon held Thursday underscored the powerful presence of Asian buyers. A crowd of Asian collectors were still registering for paddles when the sale was scheduled to begin at 10am, and the auction opened more than 15 min late. Of the 20 Christie’s staff manning the phones, ten spoke Mandarin Chinese. Seven of the top ten lots went to Asian private collectors. A celadon-glazed carved baluster vase with a Qianlong seal mark (1736-1795) shot up to $7.9m (est. $2m-$4m). Three bidders duked it out at the $3m level and Ken Yeh, Christie’s Asia chairman who is based in Hong Kong, took the winning bid for the vase, going to an Asian private buyer. That price was world auction record for Qing monochrome porcelain. “It’s an imperial ware and in perfect condition,” said Qing Shuai Wang, who heads up the dealership Lianghang FuBiDe Art Co Ltd in Liaoning, China speaking through an interpreter. He had bid up to $3m seeking the vase for his own collection. “Today, the Chinese are desperate for Qianlong period porcelain,” he said. This great Moyra, keep it up some of the residency’s look interesting.